A healthy hit of vitamin D and toasty temperatures are always a factor when it comes to most people's holiday tick list. Whether you're looking to swap snow for sunshine with a winter warmer, or you're chasing an eternal summer – there's plenty of places to top up your tan. From the beautiful Balearics to fun-filled Florida, kick-back with sunny days spent by your own private pool. Dreamy destinations are in strong supply, so narrowing down your choices is no mean feat. Here's our pick of hot holiday destinations and when you'll find them in their sunshine prime! The more northerly parts of the globe might be deep in winter, but you'll be able to warm up in no time with a trip that takes you closer to the equator. Stunning St. Lucia is an island paradise carpeted in luscious rainforest and peppered with hidden powder-sand beaches. 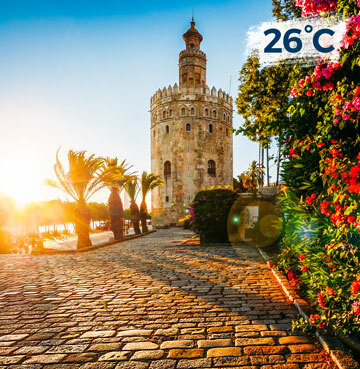 Temperatures are a toasty 28°C, and have even been known to rise above 30°C. Perfect for heat-seekers! The sea is a glorious 27°C in January, which makes exploring the breathtaking beauty below the waves just as enjoyable as what's above. Whether you're a nature lover looking to get up close and personal with the iconic Pitons, or a beach bum after your own private bay – St. Lucia in January is an unmissable hot holiday destination. Florida's gorgeous Gulf Coast is ideal for the laid-back beach lover. Sweeping sandy shorelines sprawl out for miles on end, with attractions aplenty for couples and families alike. Trade in single digit temperatures for a delightful 23°C and make the most of the Gulf's great outdoors. Revel in ultimate holiday relaxation and spend your days dabbling in wonderful watersports, world-class golf courses, strolling along picture-perfect piers and getting your fill of towel time. One of the most famous attractions in all of Florida, the iconic Everglades National Park is easily accessible too, and is one of the best ways to catch a glimpse of the resident 'gators. Shimmering Cyprus is a gorgeous Mediterranean gem that's blessed with year-round sunshine. If the scorching summer rays are a little too hot for your liking, March dishes out delightful climes for getting outdoors and discovering the idyllic island. 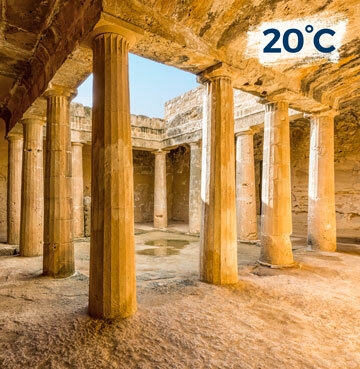 Tempting temperatures of 20°C are ideal for culture vultures and nature lovers looking to explore the wealth of things to do in Cyprus. A mountainous middle awash with wonderful waterfalls and fantastical forests – here's a nature snapshot you don't want to miss! Be sure to pack your hiking boots and get up close and personal with the Troodos range and Mount Olympus. Teeming with historic treasures and archaeological sites, wander through the ruins of the Tomb of the Kings or visit Roman villas and castles. Adorned with magnificent mosaics that depict scenes from Greek mythology, a visit in March gives you a free pass on the peak season crowds. Malta's sister island Gozo may be small, but it is most definitely mighty! A romantic and relaxed atmosphere, this is the place to be for springtime sunshine. 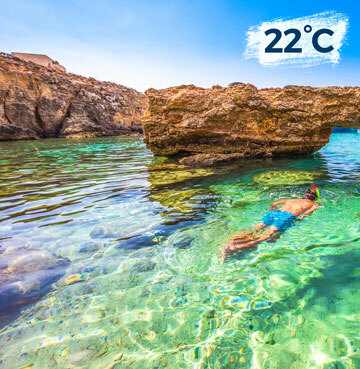 22°C and counting, April is the month where Gozo's temperatures up the ante. Bask on blissful beaches and enjoy the season's first set of beautiful balmy evenings. The early bird catches the worm with an April holiday to Gozo, so make the most of Comino's iconic Blue Lagoon without the crowds. Similar to Cyprus, Gozo is another one stop shop for visitors seeking a taste of the great outdoors! The island's call to adventure will satisfy even the most intrepid explorers. Between the charming countryside peppered with magical Megalithic Temples and the craggy coastline punctuated with sea caves and towering clifftops – you can pick the pace of your outdoor pursuits! May is one of the best months of the year to visit irresistible Italy – you'll be met with tantalising temperatures rising from 22°C throughout May. With holiday villas spread across Tuscany, Umbria, Puglia, The Amalfi Coast, Sicily and Sardinia, climes will climb the further south you travel! 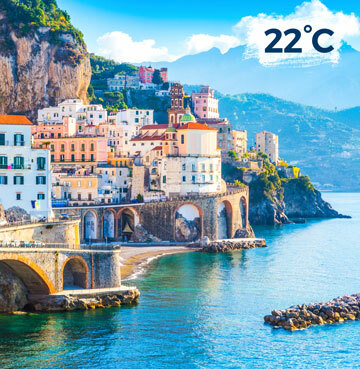 Whether you're after untouched countryside for a rural retreat, or the breathtaking Amalfi Coast with its towering cliffs and picture-perfect towns – Italy is warm and welcoming wherever you choose (and we're not just talking about the weather)! 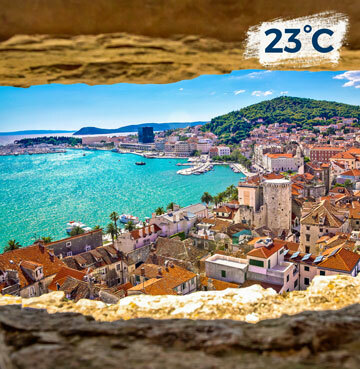 Croatia heats up a treat in June – just on the cusp of summer, temperatures average 23°C, with highs of 27°C the further down south you venture. From the rolling hills of Istria to the Old City walls of Dubrovnik, there's never a dull moment in this captivating country. Summer is well and truly here and these Kefalonia's shores welcome you with open arms. The trendsetter for peace and tranquillity, you'll experience a whole new level of rest and relaxation. One day melts into the next with scorching 30°C highs – all in a day's work for this gorgeous Grecian beauty. Whether you're soaking up the sun in your own private pool or topping up your tan on the sugar-white sands, indulge in a carefree getaway for a serene slice of the holiday high-life. Life's a beach in Kefalonia, especially in July! Boasting some of the most gorgeous bays of all the Greek islands, the crystal-clear waters' colour spectrum flows with every imaginable shade of green and blue. A certified Hollywood blockbuster destination, if it's good enough for Captain Corelli's Mandolin. It's good enough for us. When it comes to hot summer holiday destinations, there are few that can rival the amazing Algarve. Full to the brim with sun-soaked shores made up of small coves and sweeping bays, this perfect Portuguese paradise is a haven for families chasing fun in the sun. Not that there needs to be much chasing in August, with daily averages of 28°C! The hallowed golden beaches are among some of the most iconic in Europe and many of them fly the Blue Flag. If the toasty temperatures get a little too hot, take a dip in the refreshingly cool waters of the Atlantic. Between sleepy fishing villages and bustling resorts, there's plenty of ways to spend your days and make the most of the wonderful weather. Another captivating Canary Island, jet off to somewhere completely out-of-this-world and explore the lunar landscapes of Lanzarote. A tried and tested winter escape, this idyllic island will make all your festive dreams come true with a double helping of reliable rays. 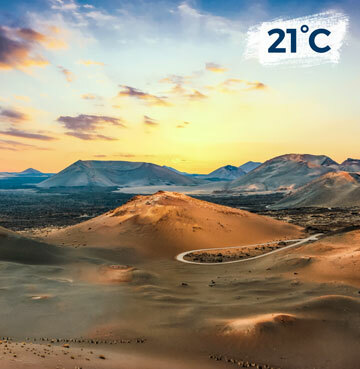 Rarely falling below 21°C, forget about your woolly hat and don't forget the factor 30. Beautiful blue flag beaches are just as enticing in December as they are in July, so be sure to enjoy a dip or two in the crystal-clear waters. The island has UNESCO's stamp of approval, and the winter months are the perfect time to see the landscapes come to life. Jam-packed with all kinds of breathtaking blooms and luscious vegetation, there's no better excuse to get outdoors and take it all in. Blessed with countless panoramic lookout points, treat yourself to natural highs and drink in the dramatic vistas. A hop, skip and a jump from the coast of Africa, the 'island of eternal spring' is still sizzling thanks to the winds sweeping through the Sahara. 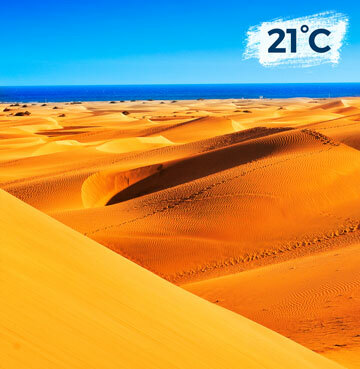 Gran Canaria's gorgeous landscapes are a welcome change from rapidly falling temperatures – how does 21°C sound? Don't pack away your summer wardrobe just yet, unless you're popping it in your suitcase! Wild and untamed beaches are waiting in the wings, along with stretches of sand stocked to the brim with fun activities for when you're taking a swim. Dramatic dunes roll for miles at Maspalomas, whilst a stroll around the sleepy fishing village of Puerto Morgan is sure to give you the end-of-year recharge you've been craving. An autumnal adventure like no other, Andalucia's sun-baked beaches and majestic mountains boast average daily temperatures of 26°C throughout October. While friends and family are dusting off their big winter coats and piling on the layers, you'll still be swanning around in t-shirts and shorts. With the longest coastline in all of Spain, beach days are non-negotiable for this hot holiday destination! A healthy dose of tradition and culture is sprinkled in among the sunshine. Fantastical fiestas are a regular occurrence, with bull fights and flamenco dancing being just some of the highlights you'll be able to catch in October. Teeming with unspoilt areas of natural beauty, the warm weather is the perfect pairing for hopping on a bike or setting out on a hike and enjoying all that Andalucia has to offer. Summer in the UK may be drawing to a close, but that's most definitely not the case for magical Mallorca. Get ready for long, lazy days spent at the beach or by the pool thanks to the still sizzling sun. A heavenly 27°C, the holiday heat is in strong supply! Music to holidaymakers' ears, September in Mallorca is the answer to your eternal summer prayers. Leisure and pleasure are the name of the game, with countless ways to spend your days. From wet and wild waterparks to peaceful and picturesque nature trails, the great outdoors is just asking to be explored. Stunning scenery sparkles with sun-kissed seduction and the toasty temperatures mean you can hold on to the precious warmer weather that little bit longer.